The 1997 vintage has been characterized as being low in acidity due to a rather hot month of August. 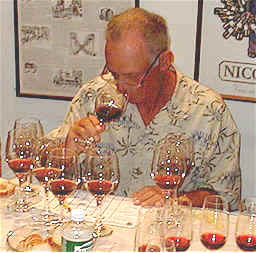 Yet in this tasting many participants found the wines to be more acidic than they'd like. We saw quite a range in quality and character in this line-up, with one wine well ahead of the pack. Notes compiled by Gerald Weisl with Bob Gorman adding his two-cents' worth..
One taster found a hint of "mustiness" here, but nobody mentioned a "corked" quality. Another found it "moldy." 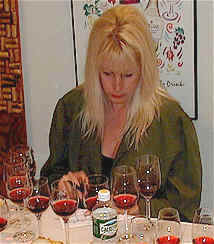 A third person described Grivot's wine as having a "short finish, a stemmy character and a shrill level of (high) acidity." One fellow sensed a note of "vinyl" to the fragrance of this, while a fifth vocalist said it "has no fruit and lots of tannin." Bob didn't find a lot to like here, finding this to be Sharp-toned, it has a queer prune juice thing. Some spice and sweet oak could not redeem the 'cherry Lifesavers' fruit, developing a Semillon-like ripe fig note. And its outrageously tannic for such thin fruit! My notes describe it as "faintly cherryish" to the aromas which fade to merely "vinous." I detected a hint of a cellar smell, too. The wine is tight and tannic, with mouth-drying tannins. It may turn into a more elegant wine down the road, but it's certainly not worthy of a special search. 7th Place: MICHEL GROS VOSNE-ROMANE "Clos des Ras"
Michel is the son of Jean Gros and he's changed the label to his own name and owns the entire "Clos des Ras." This used to be a perennial favorite, the wine always showing great depth and framed with just the right amount of sweet oak. How sad to discover this idiosyncratic wine! The first taster opined that this is a "STWM" wine. "That means 'shoot the wine-maker!" "It has a major bacteria problem, showing volatile acidity, SO2, burnt rubber..." Another taster described this wine as being more reminiscent of a Syrah. Someone else described it as "under-ripe fruit and shoe polish." "Brettanomyces and iodine fragrances" were detected by another. Bob found Vicks Vapo-Rub and wet leather from the Brettanomyces. You have to coax the Pinot fruit out of it. This is a wine for those with a taste for the bizarre. The Brett can't keep some nicely concentrated fruit down entirely but can you get past it? I found this to be rather gamey and leathery, with an odd note reminiscent of beef jerky. I found a note of smoke and charcoal, too. The same characters showed up in the mouth, making this a rather un-charming glass of wine. 6th Place: A.-F. GROS VOSNE-ROMANE "Aux Ras"
Bob found charcoal-like smoke, vanilla and cream from the oak and Malolactic with cherry Pinot fruit, a refined, lovely nose. But there is but moderate concentration to the fruit on the palate. He predicted only marginal improvement with a year or two of age. 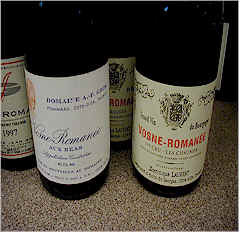 I found a rather pleasant cherry note to this sturdy, but small Burgundy. I didn't find the balance to be unusual and felt a five to ten year aging period would be appropriate. One star (on a three star scale). 5th Place: DOMINIQUE LAURENT VOSNE-ROMANE "Les Rouges"
Being the lightest-colored wine of the tasting, one wag wondered if they hadn't meant to label this as "Less Rouge." One person described it as reminiscent of "dried bark...herbal...cedar box, blueberry..." Another felt this was "subtle...too subtle and light." The color of this wine probably influenced some tasters to rank it lower. Bob eyed its very light pigmentation. His nose was greeted by a fish-emulsion odor, followed by thinly drawn Pinot fruit. A touch of elegant oak saves it with the Pinot evolving nicely in the glass. On the palate there is cherry fruit, a bit stewed, but the wine has some nice stuff, structure. Give it 2-3yrs. I felt the wine had reasonably good "Burgundian" fragrances of berry and spice. The flavors were far deeper than the color would indicate. Modest aging potential, several years at the most. One star. 4th Place: A.-F. GROS VOSNE-ROMANE "Mazires"
"This is the most closed-in wine with little aroma," said the first taster. "And it's high in acidity with tart blackberry and green, leafy flavors. Acceptable but too light." A second person found notes of "cranberry and citrus." A third said it's "far too acidic and citrusy." A fourth characterized it as being a "very skinny wine." Bob found sweet green herbs (parsley), lactic notes (fried cream) with some nicely scented Pinot in there: a "pretty" nose. Spice, fruit developed in the glass. A tight mouthful, not showing much but there's enough structure to have it evolve nicely. I found mildly smoky notes with a hint of cherry fruit and a touch of wood. The wine is structured to allow for another 5-8 years of cellaring. One star. "Warm, black fruit, silage, coffee, green, stemmy notes, low in acidity and with some body and red fruit flavors." were the words of one critic. Another felt this was "not very Burgundian." Someone else said it was the "best balanced wine of the group." A fourth person found a "menthol" note, while someone else found it to be "big, heavy in oak with coffee notes and being low in acidity, it won't age very well." Bobs favorite wine had smoke, beautifully perfumed Pinot fruit with sweet oak, sweet herbs and a nice element of terroir. On his palate there was one nice, long mouthful to justify its appellation. It needs time to show all its stuff. Splendid wine! I found a mildly earthy note with a touch of a mushroom tone and a light bacony/hickory smoke fragrance. These latter characteristics come through nicely on the palate. Limited aging potential, best to drink in the next three to six years. One star. 2nd Place: JACQUES CACHEUX VOSNE-ROMANE "Les Suchots"
One taster described this as being "quite sour." Another said the "finish was good, long and attractive." A third person noted "dusty fruit with a touch of a plummy note or a hint of 'plucot', a plum/apricot hybrid." Bob found sweet oak (vanilla/coconut), a spirity "rum-like" thing, a metallic edge and stewed Pinot fruit but it finally gained a bright point as it opened up. Oak gives this concentrated Pinot a nice breadth. Wood tannins are no problem. It holds considerable promise for the future. I liked the nice intensity to the fragrance, with a touch of a woodsy note and lots of ripe berries and red fruits. Moderately fleshy on the palate, this has enough fruit to support the fairly good structure. Aging for 7-12 years is not out of the question. One-and-a-half stars. 1st Place: DOMINIQUE LAURENT VOSNE-ROMANE 1er Cru "Les Chaumes"
"Minerally, rose petals, spicy, blueberry and showing some 'garrigue-like' notes," were some descriptors employed by one taster. "Ripe red fruit, red currants, dusty, oaky finish that's very long." was how another person described this wine. "Nicely oaked and quite admirable for its intense fruit...it's nicely varietal." said someone else. Another felt it has "good backbone," but one taster disagreed and felt this has a streak of a "volatile note." Bob liked its ripe, bright cherry fruit. It has a metallic edge and a roasted or stewed character but fruit just keeps coming on! A French roast thing is up now: very Vosne-Romane. Its soft and ripe on the palate with tasty enough fruit and length but ultimately I cant find much stuffing. I thought it was clearly superior to anything else here, having a fragrance reminiscent of cherries and strawberries and nice, sweet oak. Very classy and approaching "grand cru" quality. In fact, it's better than some grand cru Burgundies. Five to 12 years of aging potential. I'd peg this as a two star to two-and-a-half star wine.